SILVERSTONE, U.K. – My racing career started when I was nearly 5 years old. Honestly, it doesn’t seem like that long ago! My father, who had no knowledge of motorsports, decided to have a family outing at a local track west of where we lived in Florida. Moroso Motorsports Park, a multi-use facility with a drag strip, a road course and a kart track, was where my first taste of racing took place. Our adventure of watching the drag races quickly turned into us racing each other in rental karts. Fortunately for me, my dad had a very close friend by the name of Court Vernon. Court invited me and my two older brothers out to watch his son race. Shortly after, for Christmas, my father bought a kart for my brothers and me. It was a Fittipaldi chassis with an 80cc Comer engine. With fellow Scholarship winner A.J. Allmendinger. 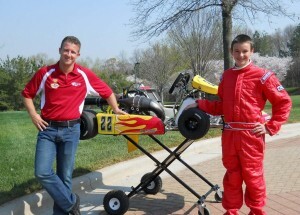 I experienced lots of ups and downs as I moved through the ranks of karting. 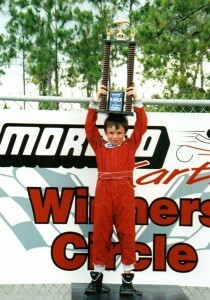 The first memorable highlight was winning the Walldinger Racing/Shell Pennzoil Scholarship. I owe a lot to A.J. 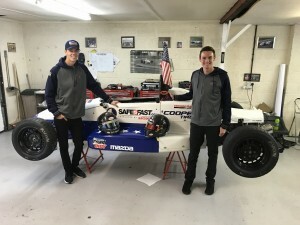 Allmendinger – who, coincidentally, also is a Team USA Scholarship winner – because although the scholarship was short-lived it opened many doors. The 2013 season proved to be the light switch in my racing career. I started off the year fully sponsored and well equipped to win races and championships with the Ocala Gran Prix team. Almost four years later, with many national and international championships under our belts, it was time for me to move towards my ultimate goal in cars. I will remain forever grateful for my time with OGP and still race on a high level in karting with Birel-ART, where we are in contention to win the SKUSA Pro Tour, but now my focus has switched. Also in 2013 I competed in my first car race with Skip Barber in their Mazda MX-5 school car. I raced a total of three weekends, and every race but one I finished on the podium. I continued to focus on my karting in 2014, then the following year began to get more serious about open-wheel racing. I began the season in the F1600 Championship Series, and actually won my first-ever race at Road Atlanta, but funds were short so I competed only occasionally. 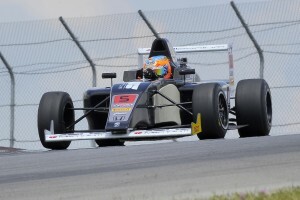 Even so, F1600 provided an essential knowledge of race cars and opened a few doors for me. Consequently, this year has been by far the best. Coming off two championship wins at the Florida Winter Tour in karting, I jumped into the inaugural F4 United States Championship Powered by Honda with Primus Racing and came away with a win and eight more podium finishes. A couple more potential wins, and possibly the championship, slipped away through a few mechanical failures, but it was still a great year. Apart from anything else, it opened the door for me to be invited to compete for one of this year’s Team USA Scholarships. After an eventful 12 years, I’m currently in the U.K. at Silverstone, one of the most iconic race tracks in the world, preparing to take part in my first test for Cliff Dempsey Racing and Team USA. It’s been an amazing journey. I tend to think my parents were crazy for putting me in a kart at the age of 5, but my gratitude goes to them and everyone else who has believed in me and helped me to make it this far. I know this next month won’t be easy but I’m more motivated and determined than I have ever been. My heartfelt thanks go out to Jeremy Shaw, all the judges who voted me through, and everyone who has followed and helped me along my career path. I will keep you all updated on results, plus anything else I think will entertain you during my stay in England!